Click the image below to visit the Feline Fix by Five website. For decades, veterinary students have been taught that six months is the minimum safe age to spay or neuter companion animals. Over the past twenty years, some veterinarians have begun to spay earlier, as early as two months/two pounds. 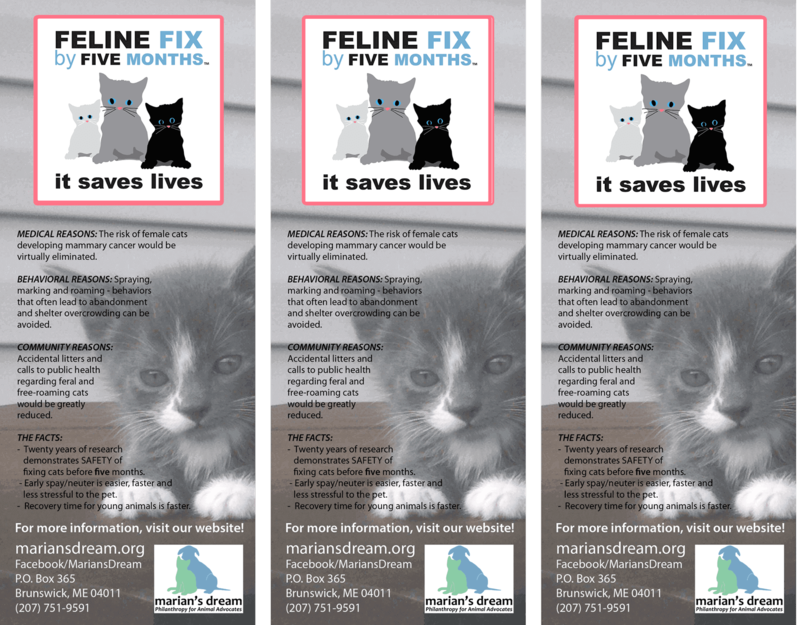 The Marian’s Dream Fix by Five Months Program advocates that the age for spaying/neutering cats be moved back by just four to six weeks. This small change would remove the risk of unwanted litters by ensuring that these “tween” kittens will not have that accidental first “whoops” litter. A study by Andrew Rowan projected that close to 90% of unwanted kittens and pups are born to mothers who would be spayed after the litter was born. A survey by the National Council on Pet Population Study & Policy showed that nationwide about 70% of cats entering shelters are euthanized. There are areas that are much higher – cats’ chances of finding a permanent home once they enter a shelter are slim. There are far more cats than there are good homes. To address this problem we can move the age of sterilization back one month, eliminating the possibility of litters during that delicate period between kittenhood and maturity. This simple change in timing could prevent an enormous number of litters. It has been estimated that if even 35% of cat guardians would spay/neuter before maturity, the birth rate of cats would fall enough to ensure that every cat has a chance at a good home. If you are a veterinarian who spays or neuters cats before their first heat, please visit www.felinefixbyfive.org and click on add your practice to the list. Learn how to Take Action!